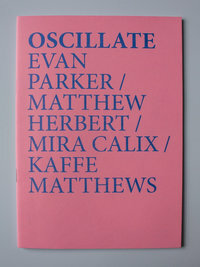 Emerging from a series of public artist talks of the same name at Turner Contemporary in Margate, the writings in Oscillate serve as fascinating literary counterpoints to the artists’ practices, giving valuable insight into the creative process and conceptual context for their work. Collectively, the diverse writings in Oscillate highlight the role that experimental art plays in both reflecting and influencing the cultural arena in which the work is made and experienced. As such, the project represents a important addition to writings in the field of contemporary music and sound. Oscillate is edited by Robert Stillman and published by Compost and Height in collaboration with the School of Music and Performing Arts at Canterbury Christ Church University. Risograph printed in an edition of 300, A5, 50 pages.